Update: Chrome now encrypts password data and this method no longer works. If we find another method for recovering Google Chrome passwords, we’ll update this article. Aren’t saved passwords great? No more racking your brain to remember obscure login credentials or locking yourself out of your account after too many failed login attempts due to typos. These are especially common inconveniences if you have a decently strong password with non-dictionary terms, uppercase and lowercase letters, numbers and symbols. But the problem with the luxury and ease of saved passwords is that after months, perhaps years of relying on saved and auto-filled login credentials, you just plum forget what your passwords are. UPDATE: At the time this article was written, Google Chrome did not encrypt password data. These instructions will no longer work. 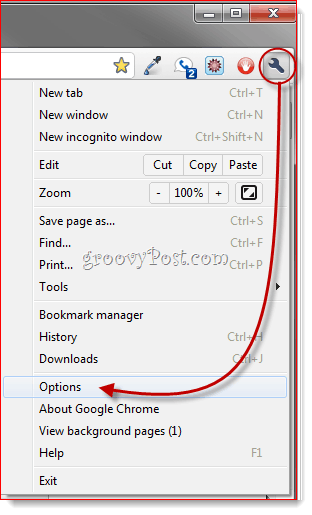 We will update this post once we find a new method to recover Google Chrome saved passwords. 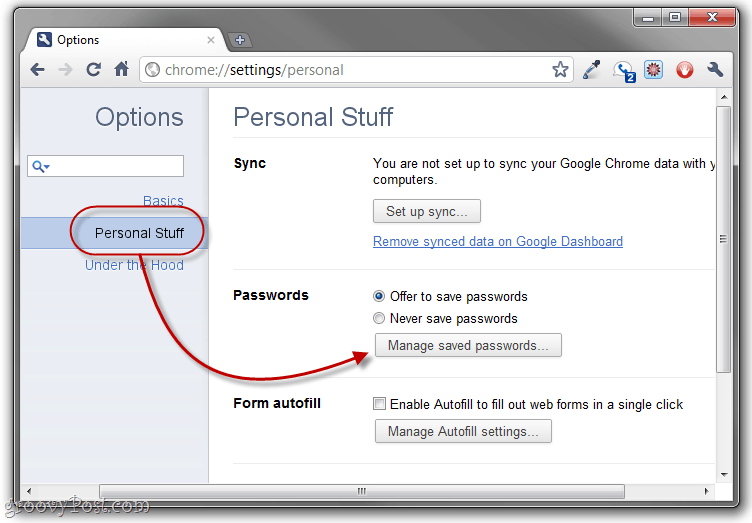 Google Chrome saves passwords used in web forms and log ins. You can manage these saved passwords as well as view them (to jog your memory) from within Google Chrome’s Options menu. Launch Google Chrome. Click on the Wrench icon in the top-right and Click Options. This will display all of the passwords that Google Chrome has saved. When you first view them, the password values will be masked. But you can display them by selecting a login and Clicking Show. If you are at all paranoid about your security and privacy, this is immediately problematic for obvious reasons. A good solution: Tell Google Chrome to Never save passwords. Or, you can go through and delete individual passwords by Clicking the X next to each one. This is something you should do if you accidentally saved your password on a friend’s computer or a public PC. If you are on a trusted computer and don’t mind saving your passwords, Google Chrome’s password management feature can actually be pretty useful. 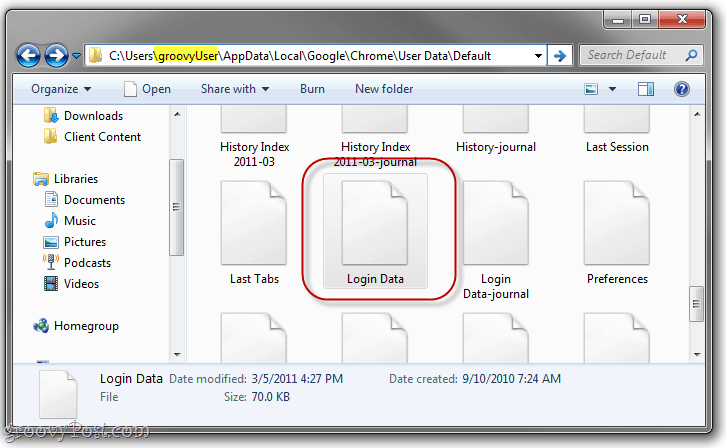 Your saved passwords are kept in a file called “Login Data” in Google Chrome’s App Data folder. You can back this up, save it to a thumbdrive and copy it to a new computer in order to transfer your saved passwords. This is also handy if you plan on re-installing Chrome, but don’t want to lose all your saved passwords. Locate the Login Data file. Click and Drag it to another location, such as your desktop, your Dropbox folder or a thumbdrive. You don’t have to, but it’s a good idea to Rename the file to something that denotes it as a backup. I like “login data.bk”. That all being said, a much better and more secure solution is to use a dedicated password manager, such as LastPass, password corral or password safe and sync your passwords with dropbox. But that’s another groovyPost for another time! Irrelevant question: what is the image editing tool that you are using to mark those red guiding lines. You can use MS Word to get the outline and the shadow. Take a screenshot of what MS Word shows and save it as a separate image. AWESOME, have been nervous about this for a long while. Perfect solution!!!!!! And I learned other things as well! THANK YOU! Superb! really helped – thanks! hello!,I really like your writing so so much! percentage we keep up a correspondence extra about your post on AOL? I need a specialist in this space to resolve my problem. Maybe that is you! Having a look forward to see you. I tried to replace ‘login data’ for the password, It looked working list and username show well butht no password shown. Only the passwords were blank. How do you solve at this? If I re-install windows, then the backed up password file won’t work for chrome. It will only show usernames, but no passwords. How to fix that? Can i copy this fill to all my Pc and i will have the same pass and user on my browser ?? Unfortunately it seems it doesnt work. Scroll down (everything is alphabetical), then you’ll see the file. Then you can proceed with all he says here. it sounds like it’ll work! I saved it to my external hard drive, and renamed mine to Login Data.bk (as you suggested). Looks good, thanks!! Just one question, can we follow basically the same procedure for Mac (Except for different folder system and whatnot)? Or is it completely different? I want to see the file in a text format ? Is there any way which enable to arrange the passwords in txt file ?? I have the same problem of yeon and exparta, usernames showing but blank passwords, please please I need to retrieve them , how can I do it? 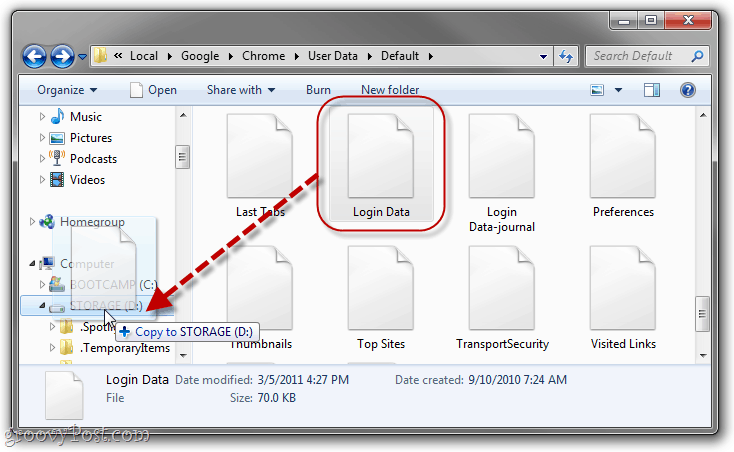 How can i find the Equivalent for android login data file ? cause i have deleted by mistake the passwords, and i have a phone and a laptop that ware offline at the point, the only way i can recover the passwords at this point. This doesn’t work. Passwords are encrypted using local windows user credentials, which are different on different computers. Nice try, though. Hello, could you elaborate how? good .. i didn’t thought there is a single file like this for saved passwords ! Finally the answer I was looking for, there’s a lot of duplicate “look in chrome to see all your saved passwords” answers, but nobody specifies the file where the passwords are actually saved. I tried to resave my file and I get an “Error 0x800704C8: requested operation cannot be performed on a file with a user-mapped section open.